How many readers subscribe to email newsletters? 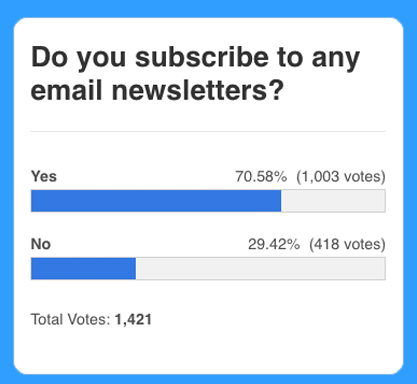 Based on 1,421 votes, the majority of poll respondents (70.6%) said that they currently subscribe to any email newsletters. We then asked you why you subscribe to newsletters and provided five reasons to choose from. 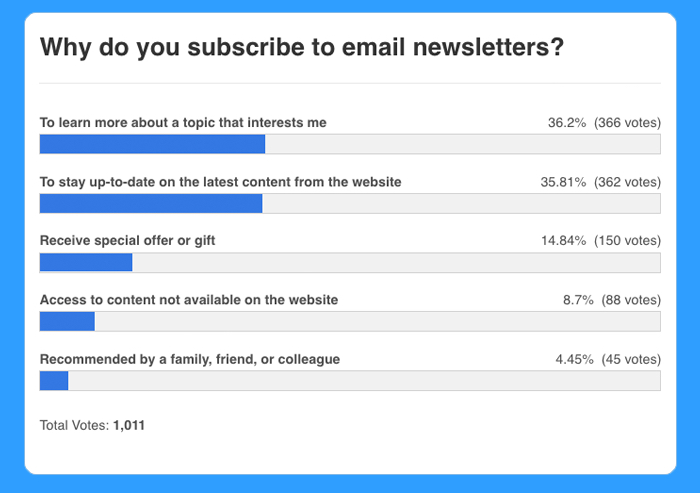 The top two reasons for subscribing was to learn more about a topic that interests you (36.2%), followed closely by a desire to stay up-to-date on the latest content from a website (35.8%). 14.8% of you wanted to receive a special offer or gift such as a discount code or free movie ticket. This was similar to another reason, getting access to content (e.g. free ebook) not available on the site, which received 8.7% of the vote. 4.5% of you subscribe because of a recommendation from a family, friend, or colleague. You preferred email newsletters over visiting the site directly to read the latest content. Email newsletters provide a reminder to visit a site you like when there is new content. Trust played an important factor in the decision as well. It’s one thing for the content to be relevant but readers also care about the credibility of the publication. You had a negative experience with sites you subscribed to previously that sent you spammy emails. You’re concerned that by sharing your email address, the site may sell it to a third party. You didn’t like being prompted to subscribe when you weren’t interested yet. Email overload: You already subscribe to many newsletters that it’s becoming hard to keep up and manage. What did you think of the poll results? Do you agree/disagree with the findings? We’d love to hear from you in the discussion below! Thanks again to those who answered our poll and shared their thoughts.